Harper’s Weekly: a magazine or a newspaper? Many collectors have wondered if the popular “Harper’s Weekly” publication is a newspaper or a magazine. Well, there is really no clear answer. I’ve always referred to it as a newspaper to distinguish it from their own sister publication “Harper’s New Monthly Magazine” which, being smaller, many more pages, and issued monthly, is a more definitive magazine. Early in its history the weekly called themselves a “family newspaper”, and modeled themselves against “Frank Leslie’s Illustrated Newspaper” which began about a year earlier. If Leslie’s was a “newspaper” then certainly Harper’s Weekly was a “newspaper” as well. 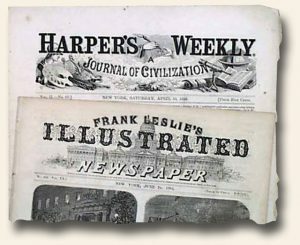 However, in Mott’s “History of American Magazines” he includes a section for Harper’s Weekly, as well as one for Leslie’s Illustrated Newspaper and other similar weeklies. Then he confuses the issue a bit more in the second volume of his book (pg. 43) by stating: “Half a dozen copiously illustrated weeklies of general appeal must be grouped separately. It would not be inappropriate to classify these periodicals as newspapers, since they all relied much upon the reporting of current events: indeed, one of them called itself a newspaper in its title. But they were all very much more than newspapers, and they placed the emphasis on features of appeal which belonged more characteristically to the magazine than to the newspaper–namely, pictures and belles-lettres…”. So there you have it. No definitive answer, but in my book Harper’s Weekly is, and always will be, a newspaper. I have thought about that and never came up with a clear answer in my mind. It is definitely a NEWS paper, but the format is the same as Harpers Bazaar or say, Scientific American, which are magazines. Thanks for your thoughts Paul. I’ve been looking at these publications because someone I’m writing about was published in them in the early 1900s. From my limited knowledge of printing technology, one of the distinctions is that these publications were illustrated with photographs (as opposed to lithographs from photographs) earlier than daily newspapers were – this was due, I believe to the speed of printing being slower (and hence suitable for photographs) than daily newspapers with a wider circulation. The person I’m researching (Herbert Ponting, photographer, journalist and much more!) wrote extensively for such publications – rather like a Sunday paper nowadays, there was less focus on immediate news and they included articles about travel, etc., in which striking photographs were ‘written round’, rather than simply used to illustrate an item of news. Sorry, rather long and apologies if everyone knows this already! Thanks Anne. No apology needed.